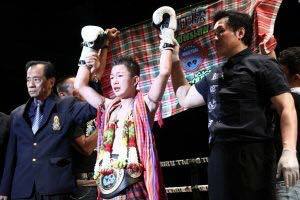 World Muaythai Council » Ryuya Okuwaki the new World Champion! Ryuya Okuwaki the new World Champion! Sunday the 8th April in the Differ Ariake Sports Stadium in Japan, Tokyo saw the latest edition of Bom Muaythai Promotions. The event is run in cooperation with the WMC and features some of the best fighters from both inside and outside of Japan. The main event saw local boy Ryuya Okuwaki face Itirit Sitk Ludet from Thailand for the WMC Pinweight World title 100 lb/45.45KG. This title was recently renounced by Japanese superstar Nadaka Yoshinari who will now head into the Mini flyweight division 105lb/47.62KG. After 5 hard fought rounds the judges gave the decision to Ryuya who was overwhelmed by the win after training so hard for this fight. In a post-fight interview he thanked his family for all their support and motivation and promised to continue to show the world that Japanese athletes can compete at the highest level. This entry was posted on Tuesday, April 10th, 2018 at 4:20 PM	and is filed under News.